"It wasn’t the bombshell everyone hoped for. 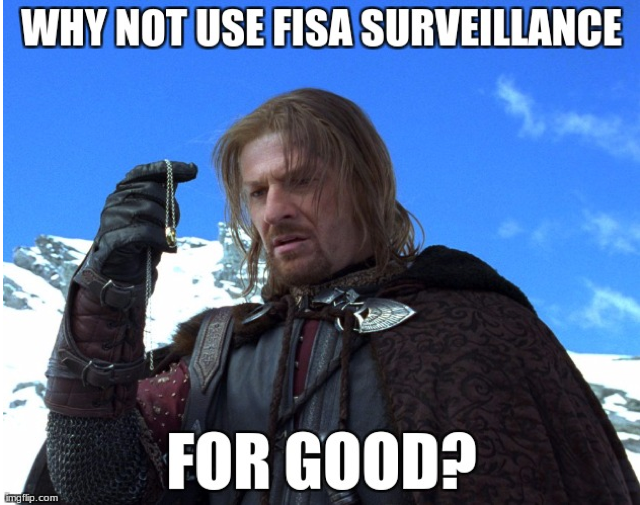 But the release of the FISA (Foreign Intelligence Surveillance Act) memo did corroborate what we already knew: the government is corrupt. So the Republicans are upset a government agency targeted a GOP ally based on information provided by political opponents. That seems like a valid complaint......"
".....On January 11, 2018, the GOP controlled House of Representatives reauthorized the Foreign Intelligence Surveillance Act (FISA)..."
".....On January 18, 2018, Nunes releases his FISA memo to the Congressional Committee........"
".......On January 19, 2018, President Trump signed the renewal of the Foreign Intelligence Surveillance Act into law......."
......"What’s going on here?..........." ...the GOP likes some mass surveillance that violates rights, just not when it targets one of their own. "They seem to think if we just had the right people in power then the government could work for good! All this shows is that power will also be abused. Secret power that much more. They are just fighting for the upper hand over their political opponents. This is not freedom versus tyranny. It is a war of factions........."
"What the FISA Memo Reveals about the FBI, DNC, GOP–and the sketchy timeline"
"......This is not an exception to the rule for Sanders, but one more addition to an already consistent and deliberate pattern. In February of last year Sanders delivered a widely viewed video message to his massive online audience solely geared at promoting the Russiagate narrative. At the end of March, he did it again. In May, he did it again. Over and over and over again, month after month after month, Sanders has been using his immense platform as the most popular and trusted politician in America to sell these world-threatening cold war escalations to the millions of Americans who adore him. This is a big deal....."
"...just because a classroom is not a good environment for many children does not mean they have a disorder. They may have an Attention Deficit because they are bored. They may he Hyperactive because they are cooped up and forced to sit still at a desk. But this does not constitute a Disorder. "Proof that ADHD is a Fake Disease"
"Fluorides, the atomic bomb, and fake news"
"What if you were to know that a cabal of corrupt bureaucrats and scientists at the heart of the Centers for Disease Control (CDC) have known for almost two decades that vaccines, including the MMR, can lead to autism and other neurological disorders? Most people are unware that CDC is a militarized federal agency further influenced by private pharmaceutical interests. Due to the politicalization of national immunization, vaccine efficacy and safety has become all but irrelevant. Its policies drive profits for itself and its partners. Now the agency is committed to have as many Americans mandated to be fully vaccinated as soon as possible, irrespective of how many lives are destroyed. The very mindset and disregard for human life that created the notorious Tuskegee experiment is alive and thriving in the bowels of the CDC......."
"More terrifying than monsters, murderers, snakes, and rats: politicians. They create horror stories that go on for decades. And their tales are real. "Proof That 50 Years of Drug Policy is Based on Lies"
"The National Security Agency maintains a page on its website that outlines its mission statement. But earlier this month, the agency made a discreet change: It removed “honesty” as its top priority. "NSA Deletes "Honesty" And "Openness" From Core Values"